By the time he died in 1931, Thomas Alva Edison was one of the most famous men in the world. The holder of more patents than any other inventor in history, Edison had achieved glory as the genius behind such revolutionary inventions as sound recording, motion pictures, and electric light. 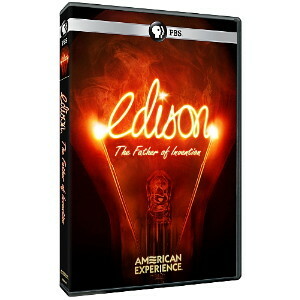 Born on the threshold of America's burgeoning industrial empire, Edison's curiosity led him to its cutting edge. With just three months of formal schooling, he took on one seemingly impossible technical challenge after another, and through intuition, persistence, and a unique team approach to innovation, invariably solved it. Driven and intensely competitive, Edison was often neglectful in his private life and could be ruthless in business. Challenged by competition in the industry he'd founded, Edison launched an ugly propaganda campaign against his rivals, and used his credibility as an electrical expert to help ensure that high-voltage electrocution became a form of capital punishment. DVD: Length - 112 minutes on 1 disc.